I love primary colors like a fat kid love cake. 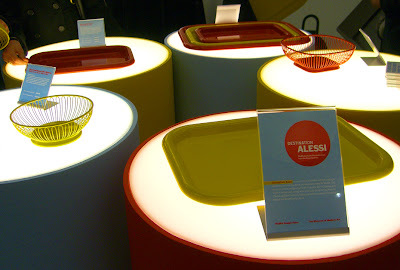 Last night the MoMA Store hosted a small fete to reveal their exclusive re-release of classic Alessi products. I've been an Alessi junkie since high school, so I got myself on the list and wore my best black-and-white mod print smock dress. At the party on Spring St in Soho, the scene outside was all confused passers-by angry at the concept of having to be on the list, while inside the prosecco flowed and the only people who seemed to be on the list were Europeans with gravity-defying hair and personal clouds of musk. Ugh, I love these people. They are the kind I'd love to have full photos of, where I can take a pencil and make notes and comments all over them. 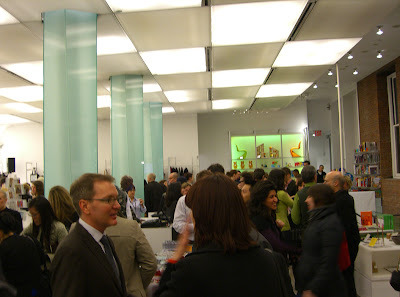 SO...making a break for the excellent finger foods (thank god for the northern Italian theme), I was quickly distracted by the bright colors and geometric shapes of the Issey Miyake Bilao tote. That is kinda how the evening went... all bold colors and shapes interspersed with beams of bright light and cocktail gherkins. And they still have MUJI stuff downstairs. I totally knew you would mention the Issey Miyake Bilao tote. I still think the green is way more beautiful and when I become a billionaire I'll have one in my collection, in my penthouse loft.